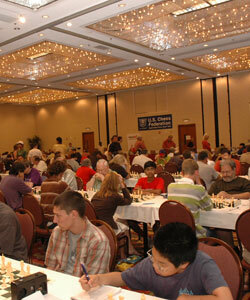 The United States Chess Federation - Three new GMs join in. Home Page Chess Life Online 2006 August Three new GMs join in. Three new GMs join in. Hall fills up as new schedules begin. The six-day and five-day schedules are on! GMs Yuri Shulman, Alexander Shabalov (six-day) and John Fedorowicz (five-day) have joined the fray. All will merge Thursday evening. In the traditional schedule the first GM vs. GM battle was bloodless. Gurevich and Kaidanov, playing on board one in the traditional schedule had symmetrical pawn structures, and once queens were traded, the draw was inevitable. Kacheishvlli, Izoria and Benjamin played lower rated players. All three GMs won. Izoria won against Michael Aigner from California. Aigner is blogging daily on the tournament on the Cal Chess site. Benjamin defeated the top twelve-year-old in the country, Michael Lee from Washington State. Michael Aigner, chess master and blogger from California. In the opening, White looks very good, but Black has the long-term advantages of a strong center and two bishops. Kacheishvili won a pawn with 35...Rh4! after Gunsen slipped with 35.Be2. One problem is that 38. axb5 fails to Rb6! After this, the rest was easy for Giorgi. GM Yuri Shulman, Chicago local, joins the six-day. Yuri Shulman won a creative and instructive game against NM Chris Land . This game is typical of Yuri's style. 16.Ne3! and 36.Ng5! are both unusual and effective tactical patterns. Click here to view complete standings after Round 5. A sole leader has emerged in the Denker: Tyler Hughes from Colorado. In round 4, he won a nice attacking game against California rep Daniel Schwarz. Black resigned after 33. Qg7+! because Kd8 or Bf7 loses to Nc6 (other knight checks work too), picking up the queen. In the Polgar, Abby Marshall from Connecticut and Amanda Mateer from Arizona are both 4-0. Their game tomorrow will likely decide the winner of the Polgar. Here is Amanda's game against Alexandra Weiner, which goes to remind us all that White's king can be unsafe in the Dragon too! Click here for complete Round 5 results. Bookmark Chess Life Online for daily color updates. To watch the top twenty boards live, check out the Monroi website. To watch the top boards live with comments and kibitzing, try ICC.